Originally a successful ISCA show car dating back to the 1970's, a frame up rebuild was commissioned in 2000, at a cost of $100K +! During the rebuild, a new balanced and blueprinted Chevy 350 V8 was installed by Mike Evans Precision Head and Block of Taft, FL, with extensive use of chromed, polished stainless steel and billet aluminum parts. The REAL star of the show, though, is the Turbonetics Evolution turbocharger with its ceramic coated plumbing and chromed exhaust. 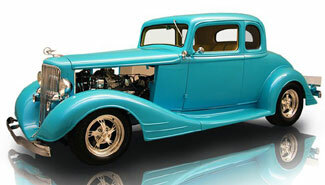 The all steel 1934 Pontiac Coupe (five window) body retains most of its original appearance with the exception of a full steel top (the original used an open top, wood framed center sections) and conversion of the rumble seat into a conventional trunk which is opened by an electric remote. The door handles were shaved are and are now opened remotely. The remaining chrome trim was polished or re-plated by Space Coast Plating in Melbourne, FL. Side hood panels have been deleted to allow a clear view of the spectacular engine compartment which is mirrored in the polished stainless steel firewall insert. The interior now features a revised dash treatment with Dakota digital gauges, including a turbo boost gauge. The chrome tilt steering column is topped by a billet steering wheel, which fits in well with all the other billet accessories. Howard Krusey of Complete Auto Upholstery in Altamonte Springs completed the interior accommodations, which consists of alabaster leather and suede.